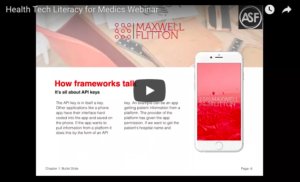 We bring to you this highly practical 1 hour webinar covering the otherwise alien language in the world of programming, development and health tech to ensure that we do actually know what we’re talking about when we look to develop an app or go seeking a job with a health tech company for the first time. Register below to access the FREE webinar. Please kindly note: registrants will be added to our free membership list on which you are welcome to unsubscribe at any time.